Lewis County PUD acknowledges that trees in rural and urban settings are a vital element in the quality of life. However, when tree limbs come in contact with power lines, it is dangerous and electric service can be impaired. Trees cause a majority of the power outages affecting our customers. Fallen trees and tree limbs that become entangled in lines, wind-blown branches that cross the lines as they fall to the ground, and tree limbs that grow into power lines are the major causes of outages. Not only are such service interruptions inconvenient for customers, but they can also threaten public safety when power is interrupted to vital services such as hospitals, traffic signals, and fire alarm systems, or to customers with life-support systems. 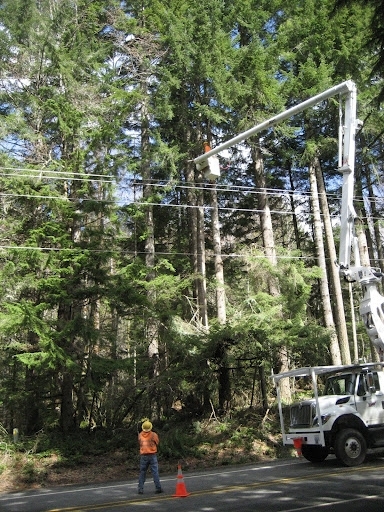 As part of our obligation to provide reliable electrical service to customers, we have developed a vegetation management program designed to keep tree limbs and shrubs safely away from power lines. We will trim all trees and vegetation around energized power lines, fiber optic cables, utility poles and pad mount transformers. All tree trimming will be done to obtain maximum clearance with due regard to current and future tree health and symmetry, and in conformity with permissions obtained. It is important to keep alleys and right-of-ways clear of debris so crews have access to perform maintenance or emergency functions safely. We attempt to maintain a seven-year trim cycle. The exact amount of clearances needed in a given area depends on the voltage of the line and the type of line construction. Line sag during temperature extremes, as well as wind movement of power lines and trees also must be taken into consideration. Any limb within 12 feet of all electrical lines will be cut back. Because proper pruning requires cutting at certain points, branches will be cut at a main branching point, or at the trunk, leaving no stub. Sometimes this may mean the branch is cut more than 12 feet from the lines, but it helps preserve the health of the tree. Trees with trunk diameters of 10 inches or less at chest height located less than 10 feet from the nearest electrical line may be removed. Any limb above the line to a maximum height of 20 feet will be removed. Certain main branches on older trees can remain inside the minimum clearance, but this depends on the health of the tree, direction of growth and likelihood of its limbs reaching the lines. All species located directly under the line that have a maturity height exceeding 25 feet will be removed at ground level. Trimming for services to residences and private lights is the responsibility of the customer. In order to reduce the risk of electrical hazards, we will drop the service wire and re-connect it after a qualified contractor has completed the tree work. There is no charge for this service, but it must be scheduled. Contact our dispatchers by completing our online form below, or by phone at (360) 748-9261 or (800) 562-5612 to make arrangements in advance. To ensure reliable electric service for the future, special care must be taken in the selection and placement of new trees. Wise tree planting will also protect street and sidewalk visibility and clearance, and prevent damage to pavement, sewers, and buildings. In addition, properly located trees can increase property values. The care taken to plant the right tree in the right place is an investment in the future. Choosing the right tree and the best place to plant will help provide beautiful, healthy trees that need little maintenance. 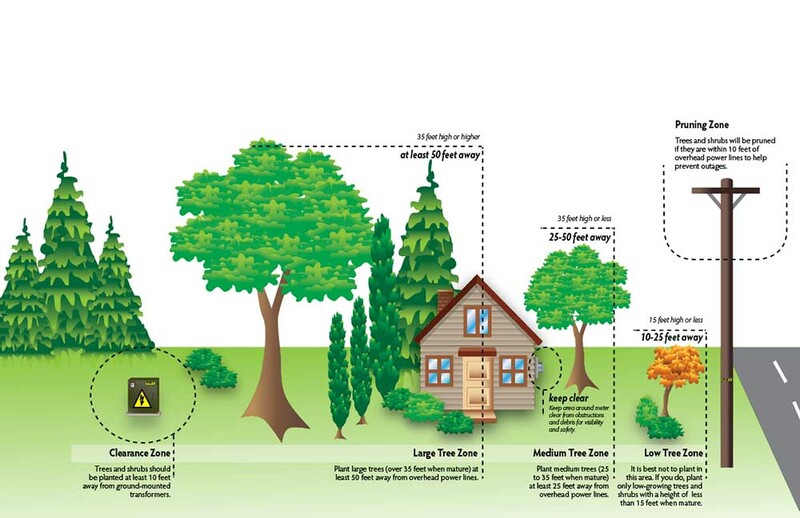 When planting near a power line, plant trees that are less than 25 feet high when mature. This reduces the chance of power outages and avoids annual pruning. There are several tree varieties at your local nursery that are suitable for planting near power lines. The following is a partial list of trees suggested for planting near residential power lines. If you are not sure if the tree you’re considering meets the mature height criteria, ask your landscape professional or visit the International Society of Arboriculture Web site at www.pnwisa.org. and select the Hazard Tree Prevention link.